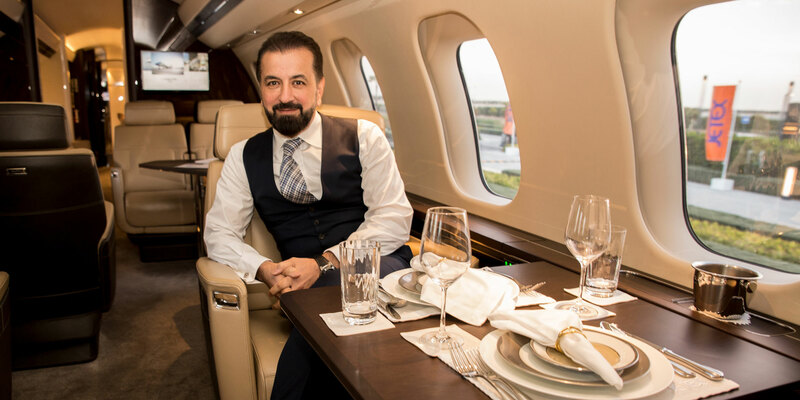 Adel Mardini started out driving business jet crews from their airplanes to the terminal. Now president and CEO of Jetex Flight Support, he credits his early experience for his success. It has become almost a cliché: a U.S.-based Jewish film critic wonders if he need fear for his life in traveling to the heart of the Arab world to accept an invitation to the Dubai International Film Festival, only to write a glowing review on returning home about Arab hospitality, luxury, and attention to detail. Although pockets of luxury to cater to the highest levels of government and ultra-high-net-worth travelers can be found all over the world, the evidence supports a trend where Arab aviation-associated businesses are making a name for themselves worldwide for their high standards. The roll-out of FBO products with Arab DNA in the U.S. and Europe has become a noticeable development. The idea of Arabs as arbiters of taste may appear far-fetched, but in a culture where the first expression you learn is "beiti beitak," Arabic for "my home is your home," the attention to hospitality in the Middle East cannot be overlooked. “FBO creation [outside the region] depends on the culture of the people, and how you convince them [of its value]. Most of them don’t believe in the level of luxury we want to bring in. The attitude is often: ‘No need to spoil them!’” Adel Martini, president and CEO of Jetex Flight Support, told AIN. Dubai-based UAS International Trip Support is making a name for itself in China. FBO development, especially in Asia-Pacific and Greater China, is benefitting. “Our China operations team has had a year of great success with the expansion of our team [a result] of a growing demand for UAS solutions in this market,” executive president Mohammed Husary told AIN. “There is still much development needed. Because of a lack of competition in some areas of the Asia-Pacific region, many airports only have one FBO that is operated by the airport itself. This results in lower standards and lack of competitive pricing,” he continued. The perception can be that quality is inferior in China compared to other regions worldwide. “However, general aviation is gradually coming to be considered as a separate field in aviation, as most stations—particularly in China—are so accustomed to handling scheduled operations. Infrastructure in Greater China is already at its limit, as the overall growth in all types of aviation outperforms the infrastructural development,” he said. The sweeping design of the interiors of Jetex Flight Support’s FBOs has become a hallmark of the company’s increasingly global commitment to high standards, prompting the question of whether the company employs a single set of design architects. In dispelling this notion, Mardini did say that a unified theme was important. “In Marrakech, we recruited a new local company. In Dubai, we recruited a local company. But the theme is one, because of our understanding of the customer,” he said. AIN quizzed Mardini on the costs of building FBOs and the ways in which Jetex drives its expansion. He said budgets varied depending on location and culture. “It depends on where and how [we create FBOs]. It starts from $1 million and goes up to $10 million. It depends on the location, and the site,” he said. Ali Alnaqbi, MEBAA’s founding and executive chairman, agreed that Arab luxury has become a marketable product and that the Middle East concept of hospitality sells well around the world. “Maybe [Arab hospitality] has a future when it comes to services. On the other hand, other markets are working very hard here in the region in promoting their products. The pressure is on when it comes to expertise,” he told AIN. But, in his opinion, it is more important for Middle East business aviation to be regarded as a cost-effective business driver than a luxury for the select few. Paradoxically, the Arab penchant for luxury has come back to bite the region’s business aviation community. For VVIP travelers, first-class scheduled service is another option increasing pressure to price services attractively. Emirates first class has become a byword for extravagance and is available on most flights. Its ‘game-changer’ first class suite debuted on the Vienna route on November 5. “Emirates’s products and services across cabin classes are continually improved and enhanced following feedback from customers. The airline pioneered the private-suite concept on commercial flights in 2003, establishing a new standard for first-class travel,” the airline said. It was UAS’s Husary who alerted AIN to the trend earlier this year. “Out of Dubai, [growing the business is now] unlikely to happen because Emirates has such a unique cabin. It’s not easy to distinguish [their services] from private jets. Sometimes they are even more luxurious. I flew on the new Emirates first-class cabin designed by Mercedes to Geneva, and it was amazing. You have a stand-up, big, wide cabin. You can close it. It’s your own suite up to the ceiling,” he said. “That’s the old story we try to sell: the efficiency and time-saving of a business jet against the cost of a first-class ticket. I think people have come to realize the cost of running and owning a business jet and look at first class and say: ‘You know what, it’s not a bad option,’" Mike Berry, executive vice president, aviation services, Luxaviation Group, told AIN. Fahad Aljarboa, acting CEO at Saudia Private Aviation, commented ruefully on the success of regional scheduled competitors, such as Etihad and Qatar Airways, whose first-class products have proved extremely successful with premium travelers. “I go back to the economics. When you have airlines investing in first-class suites, top-class services, they are just raising the bar. There is a big gap in the cost to operate. Why would somebody fly on a private jet when the main line is offering a product that is so superior at a fraction of the cost?” he said. Catherine Buchanan, chief commercial officer at Vertis Aviation in Dubai, said that Emirates is not necessarily undermining her company’s business. “Our clients are probably more discerning. Major clients are not just looking at suites, seats, and facilities, but also looking to dictate schedules or to get somewhere remote. Predominantly, [if not cost-wise], the market consists of larger groups of travelers, who have to go on routes not necessarily served by Emirates, such as a quick turnaround to Europe, or to do a meeting and head straight back, or then to Africa. They need far more flexibility,” she told AIN.